"I am the light of the world . . ."
As disciples of Jesus . . .
We will reach out to all generations to offer care, compassion, friendship, and support, we will advocate for social justice and for environmental stewardship, and we will celebrate life through joyful worship as we express God's love in the world. Services every Sunday at 10:30 AM followed by refreshments and fellowship. 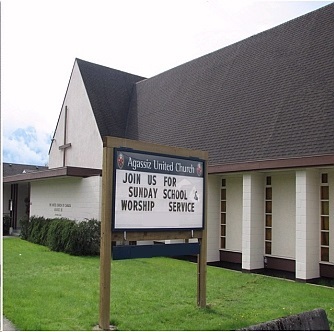 Agassiz United Church has been a part of the community for over one hundred years. As the community has grown and inevitably changed over the years, so has the church family. We cherish the connection to our past and its values, which have inspired us to continue to seek ways to connect with God. Check the Announcements page for a summary, or click on the following link to view the full pdf file--> Announcements April 14, 2019.